As weather forecasters show Tropical Storm Issac heading directly towards the Louisiana coast on August 29, we are all reminded of another storm that came ashore on the Gulf Coast on the same day in 2005. Hurricane Katrina was a Category 5 storm that wiped out towns in Louisiana and Mississippi; caused the levee system in New Orleans to fail bringing about massive flooding that destroyed large parts of the city; forced thousands of residents to evacuate; and brought cultural, economic, and political changes to the region. During the 2005 hurricane season, three Category 5 storms entered the Gulf of Mexico, with Katrina and Rita causing the most damage leaving a path of destruction and broken lives from the Florida Panhandle to Southeast Texas. 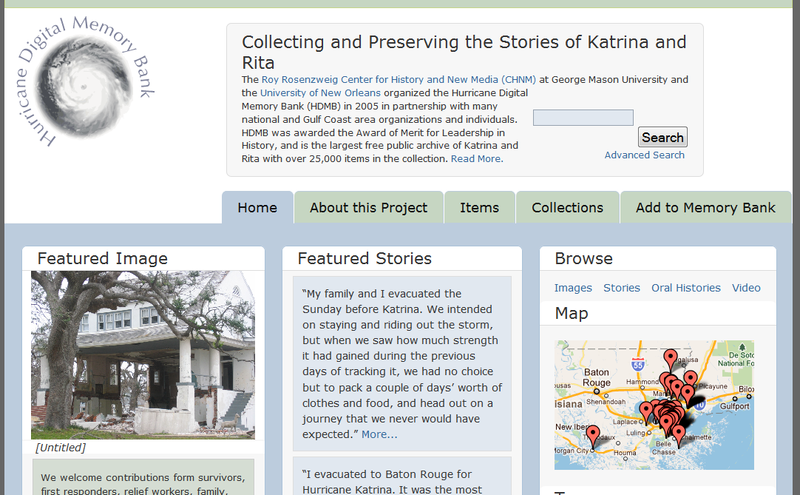 We knew we were witnessing something significant and we wanted to document and collect, preserve, and present the stories and digital record of Hurricanes Katrina and Rita. 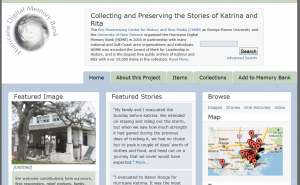 In partnership with the University of New Orleans, RRCHNM built the Hurricane Digital Memory Bank in late 2005. Following a model for online collecting established by the September 11 Digital Archive, the Hurricane Digital Memory Bank sought to help historians and archivists to preserve the record of these storms by collecting first-hand accounts, on-scene images, blog postings, and podcasts. Our target audience was anyone who was affected by the 2005 hurricanes: survivors, volunteers, concerned citizens. In effort to keep this digital archive accessible and the collecting portion active, we recently upgraded HDMB to the newest version of Omeka and refreshed the site’s design. The HDMB project helped RRCHNM test the software that would become Omeka. This project also heavily influenced our decision to release a contribution plugin for Omeka in its early development, enabling anyone to quickly launch a digital memory bank to document or commemorate events deemed significant. As we remember Katrina and its legacy, we encourage you to browse through HDMB where you will find a collection of photographs taken by Smithsonian staff in September 2005; a series of videos capturing Greta Gadney giving walking tours of the historic Ninth Ward, and hundreds of personal accounts detailing evacuation, displacement, and rebuilding. We are still actively collecting, so if you have a story related to the 2005 storms, please take a few minutes to share a remembrance with the memory bank.